Poland's Daniel Gorak and Wang Zengyi have safely moved through to the last 16 of the Men's Singles event at the 2017 ITTF Challenge Belgosstrakh Belarus Open, following successful results for both players in the closing stages of the opening day of the competition on Friday 17th March. 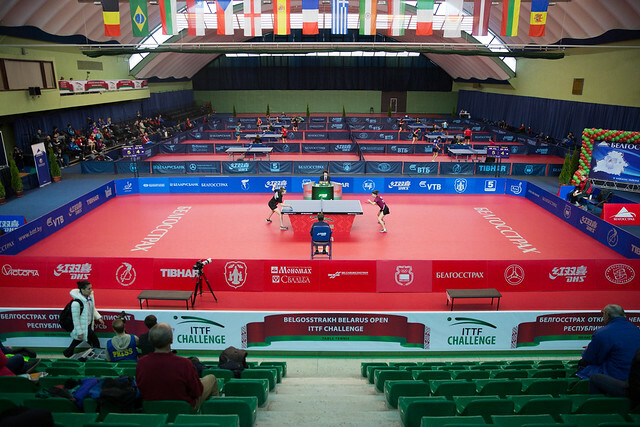 Recently crowned Polish National Champion Daniel Gorak has kept up his positive form at the 2017 ITTF Challenge Belgosstrakh Belarus Open after positing his second victory in a row in the Men’s Singles main draw. Daniel Gorak was rarely troubled by his English opponent David McBeath in the Round of 32 with five games proving enough to send the Polish representative into the next stage (13-11, 11-4, 5-11, 11-8, 11-7). The other Polish contestant to prevail in the Men’s Singles event was Wang Zengyi, who saw off Spain’s Miguel Vilchez (11-5,11-6,11-8,6-11,11-5). Runner up at the Minsk tournament in 2014 Wang Zengyi will have high hopes of achieving a strong finish this time around at the Belarus Open, and victories for Wang Zengyi and Daniel Gorak in the next round of matches could see the two competitors go head-to-head in the last eight. “My play was confident during the first three games, but in the fourth I lost concentration and consequently lost the game. All in all, the match was quite easy for me. Due to the frequent matches in the Polish league I can’t always get enough time to practice, so I’m not at my best now. Nonetheless I’ll give my utmost to win as many matches as possible”, Wang Zengyi. Kalinikos Kreanga was forced to comeback from a difficult position in his tie against Lithuania’s Tomas Mikutis, after the Greek player edged into the last 16. Trailing 2-3 at one stage in the match Kreanga, 45, used his experience to his advantage claiming the next two games in a row to pick up a dramatic 4-3 victory over Mikutis (11-4, 3-11, 7-11, 11-8, 8-11, 11-5, 11-6). “I haven’t played in an international arena for more than a year already. As I’m here after a break, it would make little sense to participate in a World Tour tournament, competing with the strongest athletes. Thus, I’ve made the decision to play at the Belarus Open. The match with Mikutis from Lithuania has been really hard for me, there were many extensive rallies that left me exhausted”, Kalinikos Kreanga. Two Belarusians will compete in the Men’s Singles Round of 16, after Vladimir Samsonov and Pavel Platonov both came through their respective closing encounters on Day One of the competition. Vladimir Samsonov, who is the no.1 seed for the category, registered a straight games success against Tomasz Lewandowski of Poland (11-3, 15-13, 11-2, 11-2) while Pavel Platonov defeated Bulgaria’s Petyo Krastev (11-9, 11-6, 11-5, 9-11, 11-7) to book a fixture with Tomas Polansky of the Czech Republic.